When was the last time you took your car in to get the oil changed and left with a bill for $80 that should have been closer to $25? 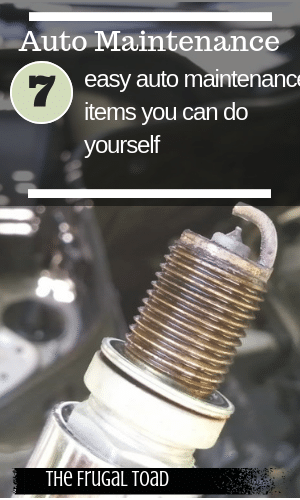 Here are some easy to do auto maintenance items that anyone can do to save hundreds of dollars in auto repair costs. Change Oil Every 5000 Miles – Savings of $50+ per year – Most automobile manufacturers are now recommending that you change oil at 5000-7500 miles for newer vehicles and not 3000 as in the past. The reason? Newer motor oils are higher quality and contain additives that aid in removing deposits and extend oil life. This is an auto maintenance item that is best left to the pros unless you enjoy getting your hands dirty. Change Air Filter – Savings of $20-$30 per year – Changing an air filter is one of the easiest auto maintenance items you can do to save money. You typically do not need tools and this can be accomplished in about 5 minutes. Change Cabin Air Filter – Savings of $15-$20 per year – This is an often overlooked item that can make a big difference in the air quality in your vehicle. This should be changed yearly and can easily be done by anyone. Cabin air filters are typically located under the dashboard behind the glove box however, check your owners manual for the location in your specific vehicle. Replace Light Bulbs – Savings of $10-$15 per year – Most people think replacing light bulbs is a difficult task. With the exception of headlights, this could not be further from the truth. All that is needed for this task is a phillips screwdriver to remove the lens cover so that you can access the bulb. Take the bulb into your local auto supply shop and they will find the replacement bulb for you. Replace Your Own Wiper Blades – Savings of $40-$50 per year – This is another automotive maintenance item that is really so easy that there is no reason to pay someone else to do this for you. If you are going to do this you might as well invest in good quality wiper blades or you will be replacing them again. Replace Turn Signal Relay – Savings of $10-$15 per year – Your local auto parts store can help you diagnose if this part needs replaced. The relay is located in the fuse box and is easily found by looking at the diagram on the lid of the fuse box. Simply pull out the bad relay and plug in the new relay. For those of you that are a little adventurous check out this video on Turn Signal Relay Repair. Clean Battery – Savings of $10-$15 per year – Another easy maintenance item that oil change shops are happy to charge you for. For this one you will need to buy a combination tool to clean the battery terminals. Mix some water and baking soda in a cup and use a toothbrush to scrub the battery terminals and posts. Replace Fuses – Savings of $10-$20 per year – The only challenge about changing a fuse is figuring out which fuse needs replaced. I have replaced numerous fuses and it really is a very simple task. Simply check the fuse box diagram located in the owners manual for the location of each fuse. With a little effort anyone can lower their auto maintenance costs by tackling these items yourself. Click to read more about other DIY projects you can do around your home to save even more money! What auto maintenance tips would you like to share? If you need help with any of these items, you can always turn to youtube or ehow and watch the videos. I was trying to only include those items that I felt anyone could do with little or no experience. I have an 10 year old truck and I plan on keeping it as long as possible. Really nice not having a payment! My husband does all of our auto maintenance and repair. He keeps my 11 year old car on the road and his 12 year old truck as well. Bartering is something I have always been curious about but have not pursued. I used to change my own oil all the time… until they put the oil filter so close to everything I could hardly get at it. I like Miss T’s idea… the general clean is a great savings! We will have to add that to the list. 🙂 Congrats on the nomination! Awesome list. I would also add general cleaning. It helps keep the interior it tact and prevents it from getting too dusty which can affect the A/C vents etc. It really is amazing what maintenance stuff you can do yourself if you are willing to take the time. I do agree with Eric though. You need to know what you are doing or you could actually break something or really hurt yourself. As more and more people hang on to their vehicles, regular maintenance will become more important. I don’t do any of these tips…but thankfully, my fiance does! He has changed oil, air filters, windshield blades, fixed car handles, replaced widget a, b, c… it’s really helpful that he’s so handy, especially because we both have old cars with a lot of mileage. Good points Eric. Choosing a frugal lifestyle does require setting some priorities. It also is a very personal decision on how you value you time. This article was for those that do not have a lot of disposable income and could benefit from doing some of the basic maintenance themselves and save a substantial amount of money. Personally I do all 7 maintenance items mentioned in the article as well as some major repairs like, replacing ball joints, shocks, etc. however I no longer change the oil. I have saved thousands of dollars over the years. The average person can do these 7 items without harming the vehicle. Thanks for your thoughts! I bought an old motorcycle about a year ago. It needed a lot of work. So I rolled up my sleeves, bought a mechanics manual and started tinkering. I spent hours working on it. It didn’t cost a lot. Most of what I spent was for tools which I now own. And I learned A TON about how engines etc. work. I’m no longer daunted by the thought of changing my own oil, checking tires, etc. And it really does save a lot to do the work yourself. After you do it once or twice you realize how easy most maintenance chores are. And they get a lot less scary. I would not recommend doing anything on your own if you have no experience or are not mechanically inclined. It is always cheaper to have something done properly the first time than it is to attempt to do it, screw it up, cause more damage and have to have someone else fix it anyway. Plus, the amount of time you can spend may simply not be worth the savings, especially if you have a lot of things going on in life to begin with. It all depends on what a person is adept and comfortable with. Personally, I always take my car in for an oil change. Of course, I’m always up early even on weekends, so I’m the first one there and I have a corporate savings card thing from a friend that gets me a change for $16.99 plus the $3 shop fee, and it includes a tire rotation so I can’t complain. I am guilty of not doing ANY of these 🙂 We keep planning to see some youtube posts on how to do these things but never get to it. Recently car maintenance has been a big line item in our budget, out of necessity we will have to learn these skills. Servicing is a super expensive.. I think shome people are a little intimidated to look under the hood Hunter. These are items anyone can do! Great article. I have to agree, a little automotive know-how can save a lot of money. My Honda dealer wanted to charge $60 to change the cabin air filter on our 2010 Insight. I can do it in 2 minutes. The service department is the most profitable part of a car dealership, and I can see why. I do most of the repair and maintenance on my vehicle and the savings really add up!